Yoon Jong-bin delivers a twisty, true-ish historical epic that offers a peek at how North and South Korea really do business. It may be noble to go undercover — for someone to erase their identity in service of a cause or country — but it rarely seems to end well, or produce meaningful results. At least not in the movies. Infiltrating an enemy faction is fraught with danger, and getting out alive can become a full-time job unto itself. Whatever idealism the hero starts with is slowly whittled down to raw survival, as even the most useful spies tend to become liabilities for the agencies that assigned them to their mission. It’s the kind of lesson that you can only really learn after it’s already too late. There’s always that moment when the protagonist realizes they’re in so deep they can no longer see the surface, and it’s usually followed by that moment when they realize it’s exactly where they’re supposed to end up. No one is looking out for them, because the state only looks out for itself. 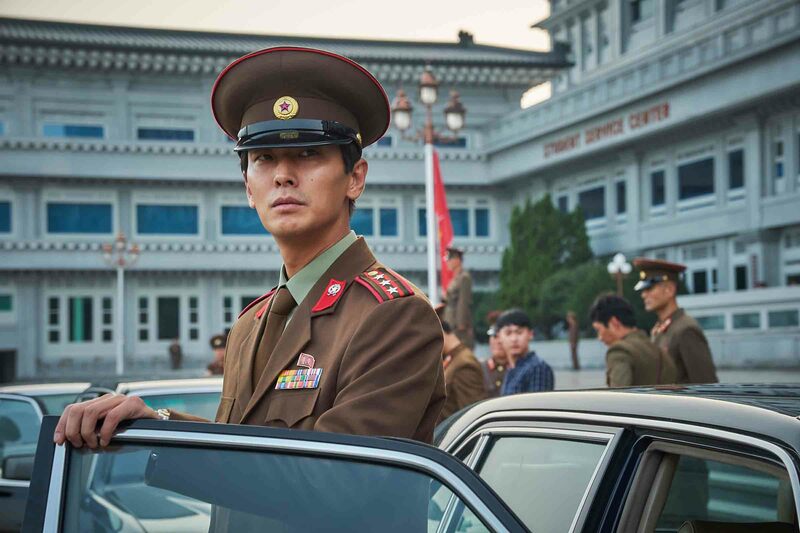 A twisty, hyper-talkative historical epic that peers behind the curtain of political theater to offer a peek at how North and South Korea really stay in touch, Yoon Jong-bin’s “The Spy Gone North” tells a true-ish story about all the invisible people who have to be sacrificed for these two rival countries to sustain their mutual self-interests. Entertaining and exasperating in equal measure, it’s a nine-dimensional chess game in which the pawns think they’re working towards a better future, but the powers controlling them are only determined to maintain the status quo. The intrigue begins in 1993, when worrying news about North Korea’s nuclear program forces South Korea’s National Intelligence Service (NIS) to introduce some new pieces onto the board without breaking the illusion of a stalemate. Enter ex-military intelligence officer Park Suk-young (Hwang Jung-min), who’s already been recruited to go undercover in Pyongyang by the time the film begins. Even though the film is strewn with his voiceover, we never learn all that much about who this middle-aged everyman might have been in his previous life — we never get much of a bead on “the real him.” As far as we know, he’s just a decent guy whose moral compass points him towards preemptively stopping World War III. And Park just might be the guy to do it. He’s careful and clever, and knows that infiltrating the highest echelons of the North Korean government won’t happen overnight. The first hour of the film is devoted to watching Park establish his cover, a long and painstaking process that involves faking loud phone conversations, planting hairs around his Beijing hotel room, and inciting an international dispute over walnuts. If Yoon gave these details the attention they deserved, we’d probably be looking at a 10-hour miniseries, but the director chooses to spend a quick moment on every aspect of Park’s strategy rather than devoting special attention to any one of them. The results can be vague and tedious at times, even though Jo Yeong-wook’s pulse-quickening score never lets up, as the “Oldboy” composer helps to assure that we never forget what’s at stake. Park’s masterstroke is to disguise himself as a bumbling and unrepentant capitalist — it’s easy to trust someone who only cares about money, because you always know what they want and how much it will cost you. Hwang plays this part of his character to a tee, and with more than a whiff of Paul Manafort about him. He tells his North Korean contacts the kind of lies that a shady businessman might, knowing they’ll see right through them for the shame underneath. Eventually, Parks earns the wary trust of a the high-ranking Ri Myong-un (Lee Sung-min), and is granted a meeting with the Supreme Leader himself (the film’s computer-generated Pyongyang is almost as convincing as the actor who plays Kim Jong-il, Yoon putting both on full display in a remarkable show of confidence). The next thing he knows he’s leading a fake campaign to shoot South Korean commercials in the hermit kingdom, having a very real effect on the relationship between the two countries, and playing a pivotal role in the 1998 election of President Kim Dae-jung. As viewers familiar with Yoon’s previous work (particularly 2005’s “The Unforgiven,” a grueling psychological drama about South Korea’s compulsory military service) might imagine, anyone looking for a light and fluffy version of these events is looking in the wrong place. Contemporary Korean cinema might have earned a reputation for explosive action, but Yoon cleaves a lot closer to John Le Carré than he does to Ethan Hunt; there’s little room for spectacle in a “realistic” movie this focused on the nuts and bolts of spy craft, and “The Spy Gone North” has no interest in making you feel good about the true cost of diplomacy. It’s a rhetorical question that “The Spy Gone North” doesn’t equip us to answer. In part, that’s because Yoon eschews any sort of emotional undertow, leaving us to regard Park with almost the same degree of apathy as his overseers do. We’re invested in his survival, but never at risk of overestimating his importance. There’s also the fact that Park finds himself (often literally) caught in the middle between both countries. The most electric sequences find him having to negotiate between two different sets of bugs. A horrifying glimpse at the conditions north of the border absolves the film from any threat of false equivocation, but the fact remains that his enemies want him dead more than his allies want him alive. If the noose-tightening third act never becomes quite as suspenseful as it should, that’s because the movie is either unwilling or unable to disentangle itself from all of the messy political intrigue and focus on Park’s desperate search for a way out — for even the open door he’d be presented by the slightest display of humanity. Of course, the confusion is ultimately an end unto itself. The harder it gets to understand how North and South Korea are fighting the forever war between them, the harder it becomes to understand why they ought to continue. “The Spy Gone North” opens in LA on August 10, and in select theaters across the United States on August 17.